My friend Maria has been wearing YogaToes for quite a while now. She’s an enthusiastic fan of these jelly-like feet helpers. As a New Yorker, my feet are one of my top concerns. Cobble stones, pavement, sidewalks and curbs can really take a toll on your feet! Not to mention, I’m always challenging my feet to stiletto duels in the streets. I finally decided to get YogaToes, as I way to relax and treat my poor feetsies! They came earlier this week and I’ve been using them since. They are supposed to help shape, stretch, condition, align, strengthen and stimulate toes while treating and preventing bunions, hammertoes, fatique, poor circulation and varicose veins. They have annual Labor sales in which they take $25 off the usual price of $49.95. Having missed the sale, I just searched for deals. I happened to find a deal in New York Magazine for $15 off! After a week of use, I haven’t seen much of a difference, however, as I’m mostly trying to prevent feet problems. 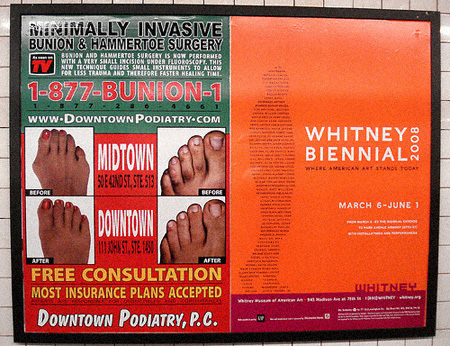 Seeing those gross bunion ads in NYC subways has really scarred my mind! I hope I never have those problems!!! Invitation Codes for Online Sample Sales!